Sweetly B Squared: A 'Cheer Me Up' Award! 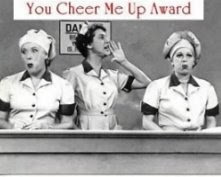 A 'Cheer Me Up' Award! Congrats. It's always nice to be thought of. You deserve it! You have a great blog. Hey...thank you so much. This scene just happens to be the joke around my house in the mornings. She looks like me preparing lunches in the morning. I am on a diet....but I seem to nibble a bit....my mouth seems to not hide things so well. I will mention this on my blog sometime over the next week. I have a couple of more that I am going to put with it. You would think with school being started I would have more time....life just got busier. Congrats on your award and thank you for passing it on to me.